The floor of your home is one of the very first things a person notices when they enter a room. That puts a lot of pressure on you to ensure that the type of flooring you have for your space not only looks good, but is capable of withstanding the day-to-day wear and tear required for your floor to remain functional. Luckily for you, vinyl flooring in Webster, TX, is the ultimate combination of durability and flexibility in one affordable package. 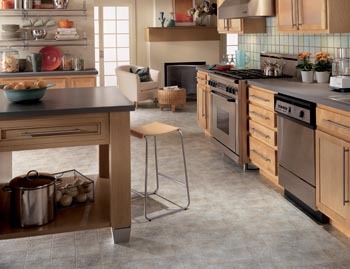 The vinyl tile flooring at My Flooring America is engineered to impress. Not only does it look good, but it also durable and easy to maintain. Even better, it can often be more affordable per square foot than most other types of flooring available to you. The ease of installation and longevity of this impact-resistant flooring option makes it the cost-effective choice for all of your high traffic rooms. Any room can benefit from a vinyl flooring installation, not just your heavy traffic areas. Vinyl comes in a variety of different formats depending on the application, which means it isn’t hard to find something suitable for any room in your home. Our expansive showroom is fully stocked with a huge variety of vinyl options, and our experts are standing by ready to help you find the perfect floor for your home. Vinyl sheet and plank flooring is a great option for any room you are looking to upgrade, but our flooring experts often recommend it for high traffic areas such as the kitchen or hallways. That is where the durability of this flooring option truly reigns supreme. Vinyl flooring is springy without being soft, which means it is very easy on your feet while still being able to stand up to even the busiest foot traffic. The water, stain, and scratch resistance of luxury vinyl flooring also makes it an appropriate choice when you are looking for a long-lasting option for a busy room. The durability of your new vinyl floor doesn’t just stop at its ability to handle wear and tear. This impressive flooring option is also known for its low maintenance requirements. That means even busy families will be able to easily keep up with the routine cleaning and maintenance vinyl requires to look good for years to come. Interested in learning more about the benefits of vinyl tile flooring? Then stop by our showroom today and begin browsing our vast selection of vinyl flooring options, including sheet vinyl, luxury vinyl tile, and luxury vinyl plank flooring. This flooring option does more than just stand up any durability test you put it up against; it also looks great in any space. Consider luxury sheet vinyl for spanning multiple contiguous rooms with a great look that is easy on the budget. Homeowners choose luxury vinyl tile flooring (LVT) when they want the style of ceramic, porcelain, or natural stone tiles with the low maintenance and cost of vinyl. We recommend luxury vinyl plank flooring (LVP) for rooms that would benefit from the space-expanding look of hardwood flooring, but without the concerns about humidity and scratches. The advantage of vinyl floors begins during the installation process and lasts for a lifetime. When you are working with a professional vinyl floor installer, you will notice that the process is a quick and easy one, no matter what type of vinyl flooring you select. That means you won’t have to wait long for your new flooring project to be finished, and your life with a beautiful new vinyl floor to begin. Luxury sheet vinyl, for example, comes in rolls and can be precut using careful measurements. This helps to speed up the installation process by ensuring every piece of vinyl flooring we install perfectly fits into place. The advantage of choosing sheet vinyl becomes especially apparent when you are looking to add new flooring throughout multiple rooms. With our professional cutting and installation services, you are able to avoid unsightly transitions between rooms and enjoy a clean, modern look throughout your home. Vinyl tile and vinyl plank flooring present their own advantages as well during the installation process. Unlike natural materials, luxury vinyl can be easily cut with a common utility knife. This enables our team of expert vinyl flooring installers to shape the floor to the exact contours of your room. When everything fits without any struggles, the installation process is instantly sped up. In addition, the accuracy of the installation process is also greatly increased to help you avoid issues in the future. What does all of this mean? It means that with all of these advantages a vinyl floor installation can often be completed in half the time it would take for other flooring materials to be installed by a professional. You are going to love the choice you have made when you choose vinyl flooring from our showroom, and you can count on our professionals for quick and easy installation. Call our flooring specialists or come by our showroom today to find the perfect vinyl flooring for any room in your home. We are proud to provide our amazing products to homeowners located throughout the Webster, Texas and the surrounding areas.